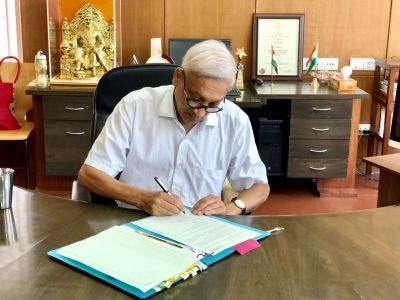 Panaji, Nov 17 (IANS) Ailing Goa Chief Minister Manohar Parrikar should hand over charge since the state administration under his leadership has been paralysed for eight months, a BJP ally said here on Saturday. "The central committee of the party has resolved to urge the government to find a replacement for Parrikar, who is ill, at the earliest," Deepak Dhavaliakar, President of the ruling alliance party Maharashtrawadi Gomantak Party (MGP), told the media after a meeting of the central committee. "Because of his illness, administration has been paralysed for eight months. He should hand over charge to someone else as soon as possible." The Opposition as well ruling coalition allies have demanded the Chief Minister's resignation, claiming that the administration has come to a standstill. Expressing support for mining dependants in the state, Dhavalikar said that his party would participate in an upcoming protest meet at Delhi's Jantar Mantar grounds, during the forthcoming winter session of Parliament, to seek resumption of the banned mining sector. "The MGP will participate in the protest meet by mining dependants at Jantar Mantar in solidarity with mining dependants seeking resumption of mining in Goa," he said. Mining in Goa was banned in February by the Supreme Court, faulting the state government for irregularities in granting second renewals of 88 mining leases, while also directing the state government to allot the mining leases afresh. BJP leaders in the state as well as National President of the party Amit Shah has assured that the Centre will work out a mechanism to resume mining in Goa at the earliest. Resumption of mining in Goa is a key issue in the coastal state in the lead up to the upcoming Lok Sabha elections.